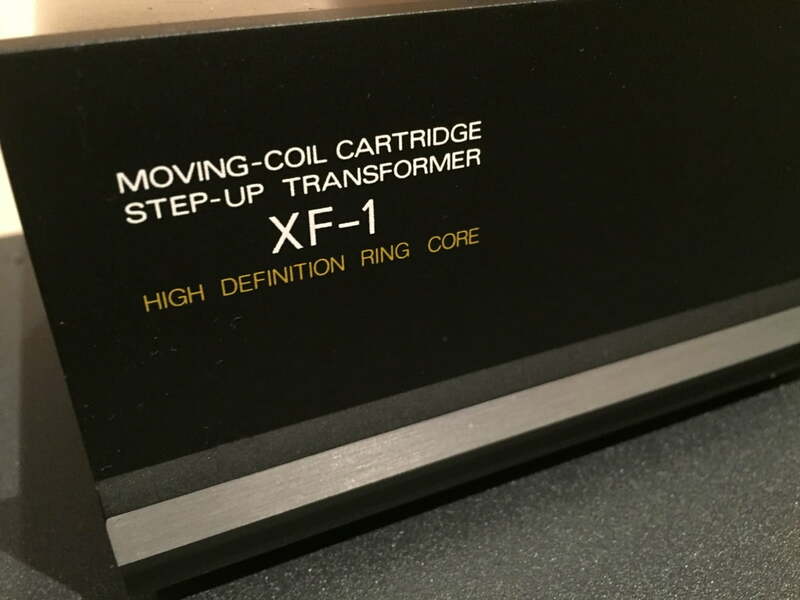 This is a review of the phenomenal Fidelity Research XF-1 moving coil step-up transformer. The short story – if you ever see one of these, grab it! Fidelity Research is one of the most iconic and revered names in vinyl. No other brand has quite the same status and FR cartridges and step-up transformers have become legendary in audio circles, for many good reasons. The XF-1 is a solid block of metal, weighing around 2kg for what is a very small and dense package! It’s worth taking a few minutes to explain what a step-up transformer is, does, and why we might choose to use one. Firstly, transformers ‘transform’ voltages, from lower to higher and vice versa. You need to transform the voltage from a moving coil cartridge because it is so low in the first place, sometimes below 0.2mV. Such small signals must be amplified hundreds of times before being sent to an amplifier. The tiny output signals from moving coil cartridges can be amplified by conventional means, with active electronics. Alternatively, part of that job can be handled by a transformer. The advantages of using a transformer are that they are essentially noiseless, passive devices, adding no hash, hum or hiss of their own. Nor do they add any coloration, being essentially just long coils of wire, wound onto metal cores. This signal boosting can be done with active electronics, but it takes some very, very good active electronics to even come close to the level of transparency and lack of noise achievable with a transformer. And by very, very good, we in turn mean very, very expensive. Just don’t expect your Cambridge Audio phono preamplifier to be in the same sonic universe as a transformer, it’s just not possible. Transformers are optimised to work with cartridges with a specific range of coil impedance. Fidelity Research offered the XF-1 in three varieties: low, medium and high impedance. My personal example is the XF-1 ‘M’, designed for use with cartridges with an internal impedance of 4-18 Ohms. This is arguably the most useful of the three, but also hardest to find. There is very little good information anywhere about these transformers which was part of my motivation for writing this piece. The Vinyl Engine has this. You might stumble across this, about the ‘M’ version being “only” suited to medium impedance cartridges. This illustrates the lack of technical understanding out there. It’s true, but the fact is that medium impedance cartridges represent the vast majority of moving coil cartridges in current use! This ‘M’ version also suited my beautiful Ortofon MC Jubilee cartridge and my wonderful Fidelity Research FR-1 Mk3. The ‘M’ version of the XF-1 is quite hard to find, presumably because people hold onto them. I strongly suggest you try to track one down, XF-1’s of all varieties are held in exceptionally high regard. If you are in the market for a transformer, this model is up there with the very best ever made. Fidelity Research only made one more expensive model and that one – the AG-X – is nearly impossible to obtain. This makes the XF-1 one of the best transformers that sensible money can buy. The Fidelity Research XF-1 is entirely dual-mono in construction and has a captive output lead of the highest quality. The inputs are also of excellent quality and all connections are extremely important when dealing with such low impedances and such tiny signals. This is one reason Fidelity Research went with a directly connected output lead configuration. Construction is massive and the XF-1 is dense, weighing in at just over 2kg, for what is a small package. 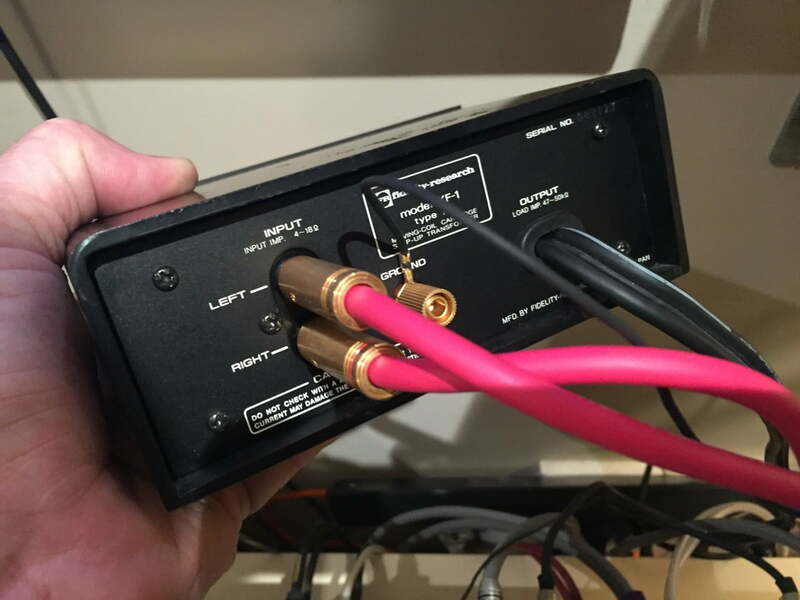 Connect the ground post on the rear to the earth wire from your cartridge to minimise any hum pickup. The back-panel is where you’ll find the RCA inputs and captive, very high quality, output lead. A quick word on my set-up and how the XF-1 integrates into my system. For the purposes of this review I have my Ortofon MC Jubilee silver wired moving coil cartridge mounted in an Ortofon LH-6000 headshell, with SME Silver Litz headshell wires, mounted to the Jelco SA-750D. All of this is mounted to my wonderful Kenwood KD-600, with custom-made MDF arm mounting base. Now, to the big question – “How does she sound mate? !” More importantly perhaps, for the roughly AUD$1000 you would pay if you shopped around, how does she compare to a quality fully-active phono preamplifier like the R32? Quite simply, the Fidelity Research XF-1 sounds sublime. This isn’t just hyperbole, as soon as you place this step-up transformer in the signal chain, the sound relaxes. Everything becomes more fluid, with reduced noise and and more open soundstage. And that one word summarises the sound you get from the XF-1 M – open. Enhanced sense of scale, tighter and more tuneful bass, more palpable midrange. Sweeter, less granular, airier highs are icing on the cake. The XF-1 provides added refinement at every step, there’s clearly an improvement across the spectrum. 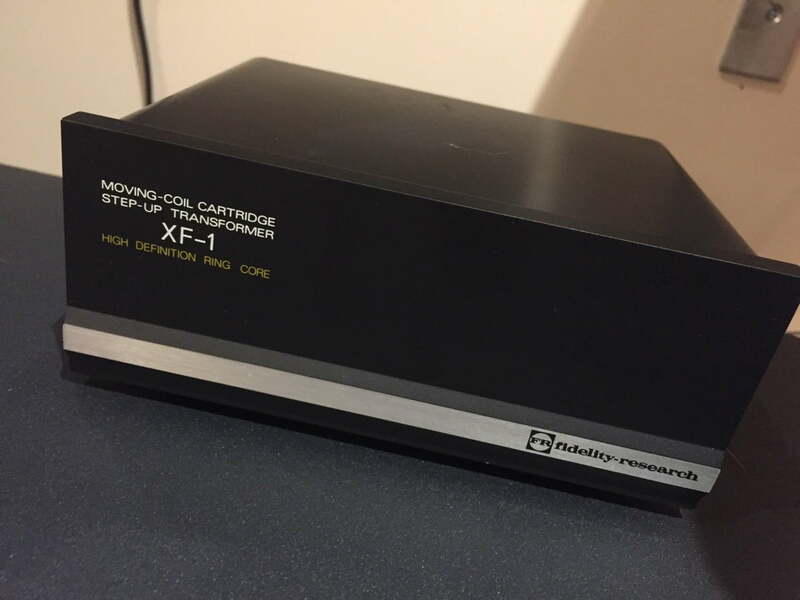 Having said all of this, the XF-1 should be better – it’s a premium transformer from the golden age of analog, from the epicentre of vinyl manufacture and from one of the doyens of that industry – Fidelity Research. None of this should take anything away from the Primare R32 – it’s excellent. But if you are chasing for the gear that will take your analog rig to that next level, you really owe it to yourself to audition a good transformer and the XF-1 is about as good as it gets. If you want the quietest, ariest, most musical performance form your higher-end moving coil cartridge,. 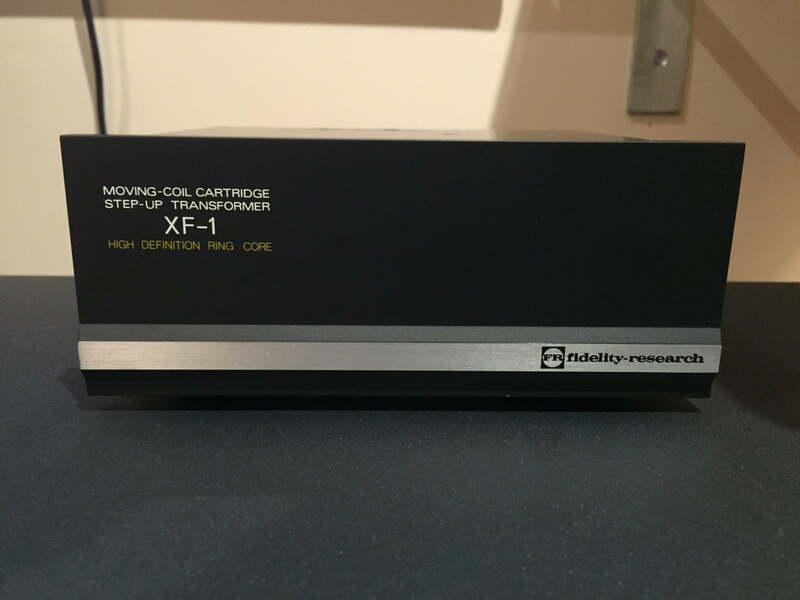 there really is only one option – a really good step-up transformer, like the Fidelity Research XF-1. Buy one and you’ll not be disappointed. Previous PostYamaha GT-2000 Direct Drive Turntable – Tweaking the BeastNext PostServicing a Gorgeous Apple Mac Pro 8-Core Beast! Hi, just wondering how the XF-1 compares with the likes of the Hashimoto HM-7 or HM-3 transformers? I’m lucky enough to have a pair of HM-3 though have had no luck tracking down a HM-7 at the right price to date. Hi Matt, thanks for writing. I’ve not compared the two, but I have compared the XF-1 to many things and the XF-1 kills just about everything else. The XF-1 was made during the pinnacle of vinyl design and artisanship, so not much can compare to the build and materials used in these vintage pieces. As a general rule though, transformers are great and I’m sure the HM-3 or HM-7 will be excellent.